7392 - SAMOA medium flag shield souvenir embroidered patch. 2.5" wide x 2.75" tall - Patches sew or iron-on & are carded for a display rack for stores. 7391 - SAO TOME AND PRINCIPE medium flag shield souvenir embroidered patch. 2.5" wide x 2.75" tall - Patches sew or iron-on & are carded for a display rack for stores. 6661 - SAUDI ARABIA medium flag shield souvenir embroidered patch. 2.5" wide x 2.75" tall. Patches sew or iron-on & are carded to hang on a display rack for stores. 6673 - SCOTLAND (St Andrews cross) medium flag shield souvenir embroidered patch. 2.5" wide x 2.75" tall - Patches sew or iron-on & are carded for a display rack for stores. 6671 - SCOTLAND medium flag shield souvenir embroidered patch. 2.5" wide x 2.75" tall - Patches sew or iron-on & are carded for a display rack for stores. 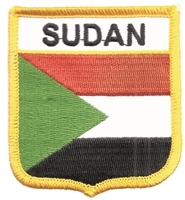 7395 - SENEGAL medium flag shield embroidered patch. 2.5" wide x 2.75" tall. Patches sew or iron-on and are carded for a retail display rack for stores. 7396 - SERBIA medium flag shield souvenir embroidered patch. 2.5" tall x 3.5" wide - . Patches sew or iron-on & are carded to hang on a display rack for stores. 7385 - SIBERIA medium flag shield souvenir embroidered patch. 2.5" wide x 2.75" tall, Patches sew or iron-on & are carded to hang on a display rack for stores. 6681 - SINGAPORE medium flag shield embroidered patch. 2.5" wide x 2.75" tall . Patches sew or iron-on & are carded for a display rack for retail stores. 6676 - SLOVAKIA medium flag shield souvenir embroidered patch. 2.5" wide x 2.75" tall - Patches sew or iron-on & are carded for a display rack. 7071 - SLOVENIA medium flag shield souvenir embroidered patch. 2.5" wide x 2.75" tall - Patches sew or iron-on & are carded for a display rack for stores. 6625 - SOLOMON ISLANDS medium flag shield souvenir embroidered patch. 2.5" wide x 2.75" tall - Patches sew or iron-on & are carded for a display rack for stores. 7384 - SOMALIA medium flag shield embroidered patch. 2.5" tall x 3.5" wide - Patches sew or iron-on & are carded to hang on a display rack for stores. 6691 - SOUTH AFRICA medium flag shield embroidered patch. 2.5" wide x 2.75" tall - Patches sew or iron-on & are carded for a display rack for stores. 6711 - SPAIN medium flag shield embroidered patch. 2.5" wide x 2.75" tall - Patches sew or iron-on backing & are carded for a display rack. 7101 - SRI LANKA medium flag shield - 2.5" wide x 2.75" tall - Patches have an iron-on backing & are carded for a display rack for retail stores. 7023 - ST KITTS-NEVIS medium flag shield souvenir embroidered patch. 2.5" wide x 2.75" tall - Patches sew or iron-on backing & are carded for a display rack for stores. 6721 - ST. LUCIA medium flag shield embroidered patch. 2.5" wide x 2.75" tall. Patches sew or iron-on and are carded to hang on a display rack for stores. 6731 - ST MAARTEN medium flag shield souvenir embroidered patch. 2.5" wide x 2.75" tall - Patches sew or iron-on & are carded for a display rack for stores. 7341 - SURINAME medium flag shield souvenir embroidered patch. 2.5" wide x 2.75" tall - Patches sew or iron-on & are carded for a display rack for stores. 6741 - SWEDEN medium flag shield souvenir embroidered patch. 2.5" wide x 2.75" tall - Patches sew or iron-on & are carded for a display rack for stores. 6746 - SWEDEN wavy flag ribbon souvenir embroidered patch. 1.75" tall x 4.875" wide - Patches have an iron-on backing & are carded for a display rack. 6751 - SWITZERLAND medium flag shield souvenir embroidered patch. 2.5" wide x 2.75" tall - Patches sew or iron-on & are carded for a display rack for stores. 6761 - SYRIA medium flag shield souvenir embroidered patch. 2.5" wide x 2.75" tall - Patches have an iron-n backing & are carded for a display rack. 6774 - TAIWAN flag uniform or souvenir embroidered patch. 3" wide x 2" tall rectangle - Patches have an iron-on backing & are carded for a display rack. 6771 - TAIWAN medium flag shield souvenir embroidered patch. 2.5" wide x 2.75" tall - Patches sew or iron-on & are carded for a display rack for stores. 7141 - TANZANIA medium flag shield souvenir embroidered patch. 2.5" wide x 2.75" tall - Patches sew or iron-on & are carded for a display rack for stores. 6781 - THAILAND medium flag shield souvenir embroidered patch. 2.5" wide x 2.75" tall. Patches sew or iron-on & are carded for a display rack for stores. 7351 - TONGA medium flag shield souvenir embroidered patch. 2.5" wide x 2.75" tall. Patches sew or iron-on & are carded for a display rack for stores. 6791 - TRINIDAD AND TOBAGO medium flag shield souvenir embroidered patch. 2.5" wide x 2.75" tall. Patches sew or iron-on & are carded for a display rack for a store. 6801 - TURKEY medium flag shield souvenir embroidered patch. 2.5" wide x 2.75" tall. Patches sew or iron-on are carded for a display rack for stores. 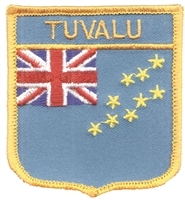 7397 - TUVALU medium flag shield embroidered patch. 2.5" wide x 2.75" tall. Patches sew or iron-on and are carded for a retail display for stores.